Get a Professions Cartoon Drawing in colored digital style. One of our professional artists will make an excellent Personalized Caricature of Hair Stylist or any other professional who will be hand-drawn from photo with a slightly funny exaggeration. We will make a bright, high quality caricature, featuring professional details and peculiarities. Your Caricature Drawing can be used as a profile picture or printed on any surfaces of your choice: Caricature printed on canvas, T-shirt, mug and others. Ordering is fast and easy. Describe any profession or hobby in the requirements box below and upload as many photos as necessary. Your Professional Cartoon Drawing will be delivered as a ready-to-be-printed, high resolution file to your email by default. We also offer you additional delivery options: Drawing printed on Canvas; Drawing printed on Photo Paper (Fujifilm Crystal Archive Paper) with different sizes of your choice. Our company offers the worldwide shipping in quick turnaround time. 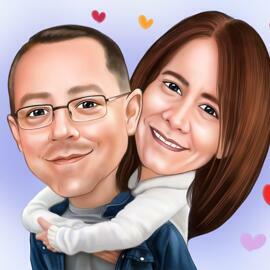 Caricature will make an incredible and awesome gift on Valentine's Day, Birthday or Mother's Day.